I’m experimenting with mac and cheese again. This was our Good Friday dinner, a meatless meal that we enjoyed with a simple salad. I wasn’t too sure about the tomatoes at first, afraid that the juice would render the cheese sauce watery, but I was pleasantly surprised. I really shouldn’t have been, because I’ve yet to taste a recipe from Ina Garten’s cookbooks that I didn’t like. The recipe calls for 12 ounces of gruyere, which is a bit more costly than the average cheddar or whatever else you can find in grocery stores. Still, I was not prepared for the $14.99 a pound price tag at my local grocery store. When I looked at the label I said, “Whoa!” out loud and got a few stares in return. Now let me explain. I love good cheese, and Michael and I enjoy trying different kinds of cheeses and making cheese fondues. But I also try to be a thrifty shopper, particularly since I’m taking a year or two off from work so that I can be with my boys full time. So the thought of spending more than $11 on just one of the cheeses for a dish was a bit disconcerting. I knew that I could probably get the cheese for a lower price at Trader Joe’s, but as much as I adore that store, I can’t take my three boys there by myself. Really, with those smaller shopping carts, I can only manage one child at a time in Trader Joe’s. So I stood there next to the cheese display, mulling over my dilemma while the boys waited not so patiently in the shopping cart. I really wanted to surprise Michael with this gourmet mac and cheese for Good Friday since he had been gone all week, but I didn’t want to fork over that much money for the cheese. I finally decided the best compromise would be to use half the recommended amount of gruyere and make up the rest with extra sharp cheddar. It wouldn’t be exactly as described in the book, but it would still have some of that good gruyere flavor. Even with only half the gruyere, we thought the cheese sauce was rich and tasty, and I would certainly make it that way again. And of course, treating ourselves every once in a while is not a bad thing. 2. In the 6 to 8 quart pot, bring water to a boil. Add some kosher salt and the pasta and cook according to package directions. Drain well. 3. Warm the milk in the 2 quart saucepan. Melt 6 tablespoons of butter in a large (4-quart) pot and add the flour. Cook over low heat for about 2 minutes, stirring with a whisk. Continue whisking and add the hot milk and cook for another minute or two. The mixture should start to thicken and get smooth. 4. Remove from heat. Add the Gruyere, cheddar, pepper, and nutmeg. Add the cooked macaroni and stir well. Pour into the prepared 3-quart baking dish. 5. Arrange sliced tomatoes on top. Melt the remaining 2 tablespoons of butter, stir them with the fresh bread crumbs, and sprinkle on the top. 6. 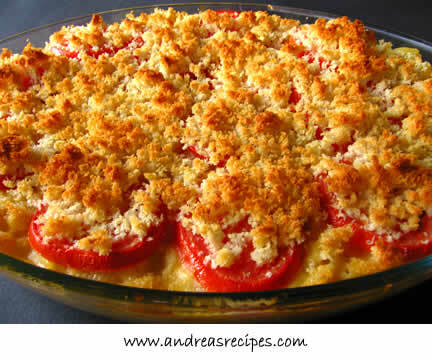 Bake for 30 to 35 minutes, until the sauce is bubbly and the macaroni and breadcrumbs are browned on the top. To make ahead, put the macaroni and cheese in the baking dish, cover, and refrigerate until ready to bake. Put the tomatoes and bread crumbs on top and bake for about 40 to 50 minutes. I like more than one type of cheese in my mac, I think it helps to add more layers of flavor- but that’s just me. I agree. Two or more cheeses in the sauce is definitely the way to go. How funny – I made this same recipe (minus the tomatoes) and had the same thought about the cheese!! I ended up cutting back on the gruyere and adding extra cheddar as well!! Andrea, this looks soooo good. I can’t wait to try it. I love Ina Garten’s cookbooks, but somehow missed this recipe. I’ll have to give it a try, although my family is VERY fond of Martha Stewart’s recipe. I have it here on my blog, if you want to see how it’s made. It, too, calls for Gruyere (but only 4 oz.) and sharp white cheddar. Delicious! andrea, thanks for posting this! I’m looking for a good recipe to try my first time! being the cheese girl at my local trader joe’s, I can tell you that ALL cheese is cheaper at my store. the gruyere I picked up today was 8.99 a pound! The 1st time I made this recipe I used 1/2 the Gruyere and just used more sharp cheedar. Instead of nutmeg i added 1tsp garlic powder because for some reason nutmeg gives me a headache(I cant expalin why)Anyway, I recently made this recipe again and forgot about reducing the Gruyere, and let me tell you, if your not a HUGE cheese fan, I suggest cutting tthe Gruyere in half. It has a very strong flavor and can be a bit overpowering. I am a cheese lover but for me the full amount of Gruyere is a bit much. I love this recipe and would reccomend it to anyone looking for a good mac&cheese recipe. The recipe looks great! I’ve never gone wrong with Ina either. I’ll have to try this. Gruyere is a more expensive Swiss cheese as is fontina. They are interchangeable to me. I almost always sub in Swiss and get the same flavor. You might want to give it a try sometime.